Sculptural vessel made by Brian Fell as seen from the master bedroom. Another sculpture in the shared garden, this time in the style of Andy Goldsworthy (but not by him). The backround figure is by Brian Fell. Tyas Cottage is a combined cottage and barn and one of three properties within a secluded hamlet in Merrydale, near Slaithwaite and Marsden. It is less than 10km from Huddersfield and 14km from Halifax. The other two houses in Merrydale are in permanent occupation. It was here, in the early sixteen hundreds, that the first water powered mill in the Colne Valley was built. 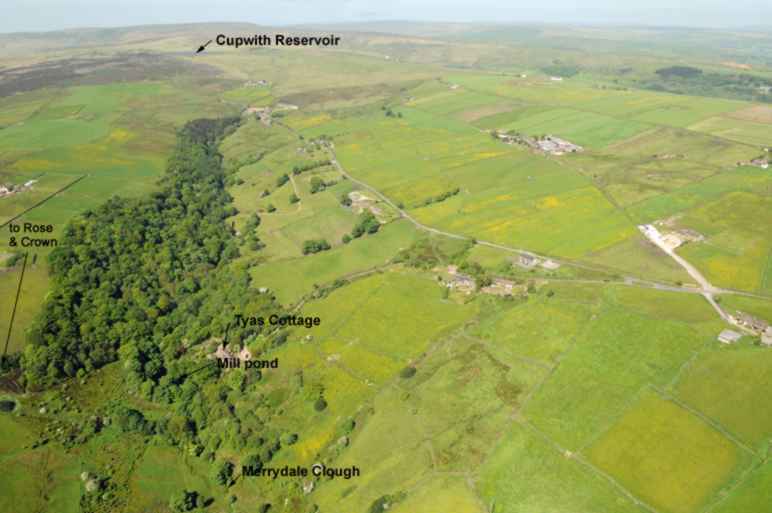 As you can see on the aerial photograph, the hamlet is surrounded by "free-to-roam" woodland and fields. Deer live in the woods, and are occasionally seen in the early mornings. Our nearest village, Slaithwaite, is only about a twenty minutes walk away. Secluded, within Merrydale, a sheltered valley, Tyas Cottage is adjacent to an ancient, cobbled pack horse road. The abundant natural birdlife of this local beauty spot includes kingfishers, herons and sparrow hawks. 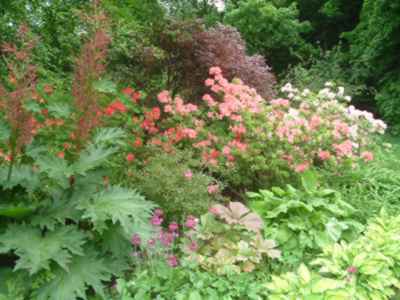 In addition to the private patio there is a large shared, award winning garden that includes a mill pond, stream and waterfall. 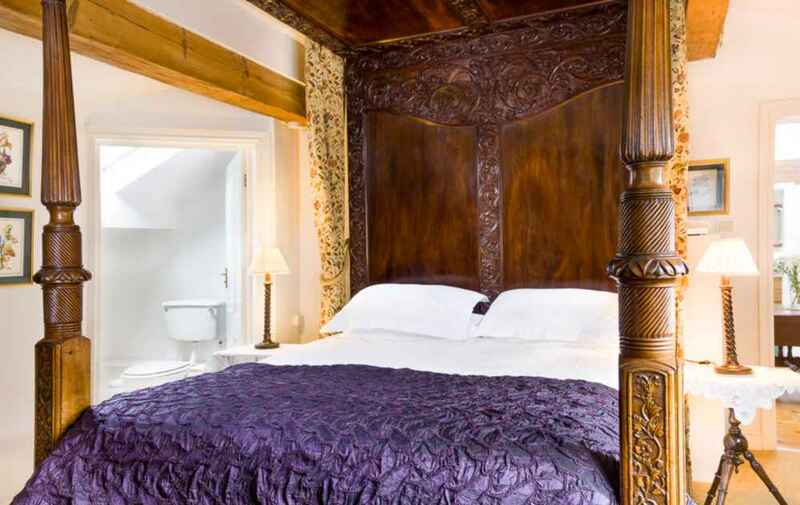 The quality of the furnishings, mainly antiques, can be appreciated from the photos, but special mention must be made of the Georgian mahogany 4 poster bed with its wooden carved ceiling. 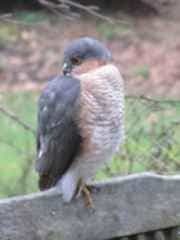 Our resident sparrowhawk, bird watching, alas! Brain Fell's pods are an excellent spot for bird watching in the shared garden. 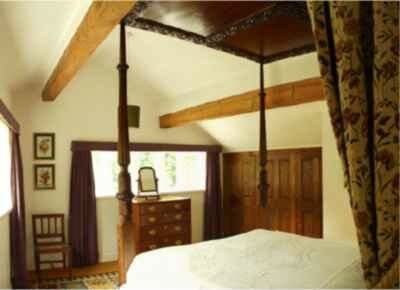 Double bedroom with antique carved mahogany 4' 9" 4 poster bed and en-suite bathroom/W.C. 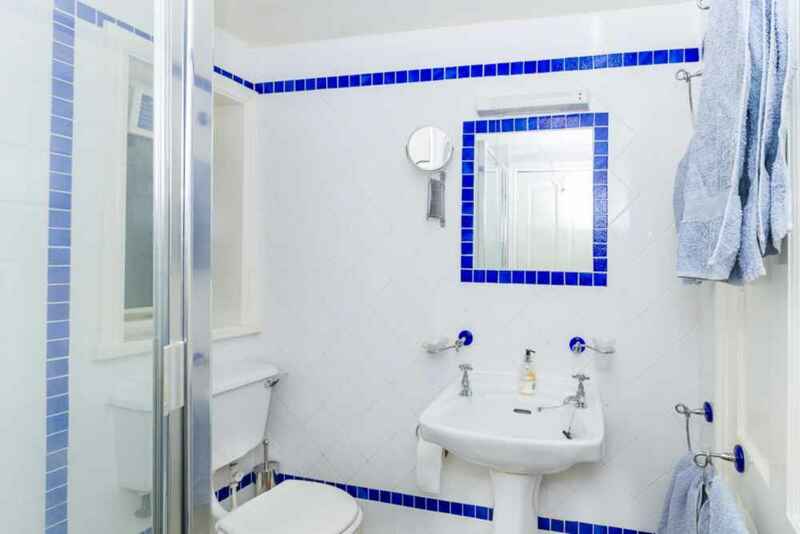 Twin-bedded room with en-suite bathroom/W.C. No 14, The top of the spiral staircase in the foreground with the antique Cape Dutch 'Armoire' behind it. 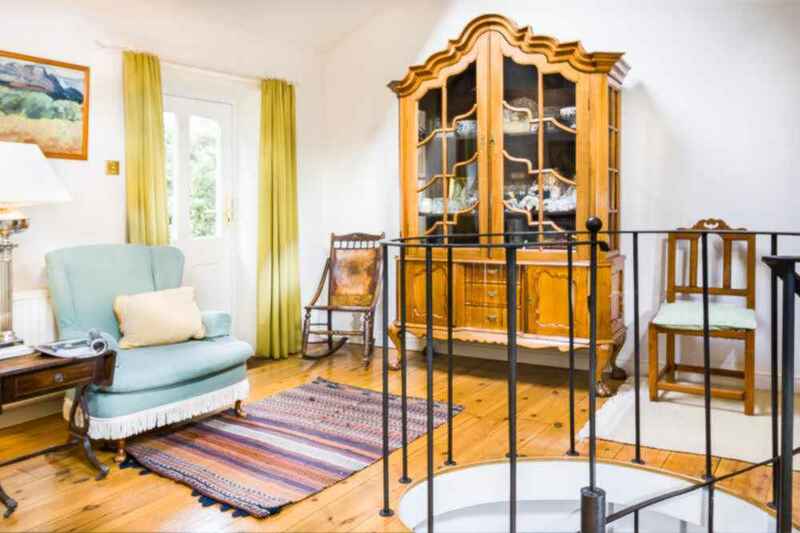 To the right is a Cape Dutch early 18th century yellow wood chair and the door to the balcony is on the left. Despite its secluded setting, Tyas Cottage is very close to numerous attractions, as well, of course to the moors and Pennine Way. 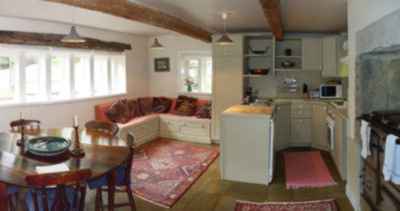 The cottage is well suited for hiking and bird watching as there are many local walks on open moors or in sheltered valleys, some of which are described on this link. 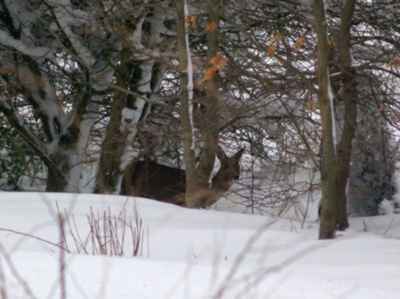 We've seen deer in the garden and surrounding woodland with far greater frequency of late. The above photo of Tunnel End was taken by Saskia Ashton. 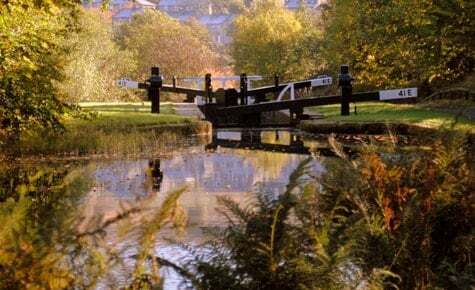 There is another lovely walk along the canal that runs between Slaithwaite and Marsden. En route you could stop off at the Olive Branch restaurant and perhaps walk off your lunch by going on to Marsden where a quick pint or two at The Riverhead (brewed on the premises) could be enjoyed before taking the train back to Slawit. 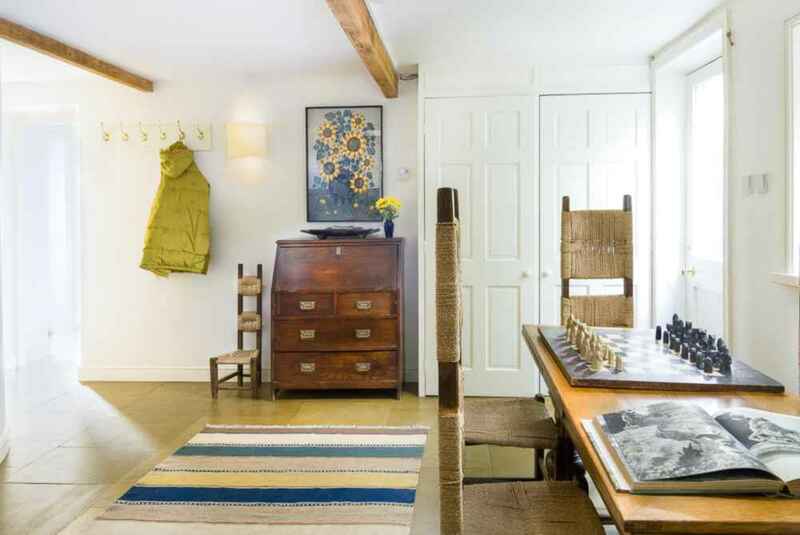 Slightly further, The Tunnel End Loft space accommodates a group of small craft businesses who work and exhibit at the Loft Space and offer creative educational activities to the public. About 32 minutes journey time away there is The National Museum of Film and Photography in Bradford. The Victoria Market and The Royal Armouries in Leeds are about 36 minutes away. The Magna Centre in Rotherham, Barnsley's Metrodome and Sheffield's Ice Centre and Ski Slopes. East Riddlesden Hall, Harewood House, Sudbury Hall (with its childrens' museum), Chatsworth, and Castle Howard are stately homes within sensible travel distance. Howarth, the home of the Brontes, is well worth a visit that could combine a visit to Hebden Bridge(allegedly'funkiest' town in Europe and the best town in Britain for independent shops). 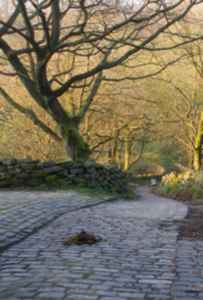 Sylvia Plath lies in the Heptonstall churchyard nearby. The best collection of Tiffany Glass outside the USA is within a reasonable distance in Accrington. Flamingo Land Theme Park & Zoo although further afield is 90 minutes car journey time away. Chester Zoo is only 75 minutes away (by car). For teenagers (or adults), Paul McCartney's house at 20 Forthlin Road and John Lennon's Mendips are surprisingly close (1hr 3 minutes according to multimap!). Canal between Marsden and Slaithwaite - a nice leve walk with the option of returning by train. 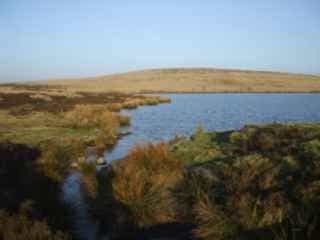 Nearby Cupwith Reservoir is a perfect destination for a moorland walk. It cannot be seen from any roads. Slaithwaite is well served with 11 restaurants and plenty of tea rooms. 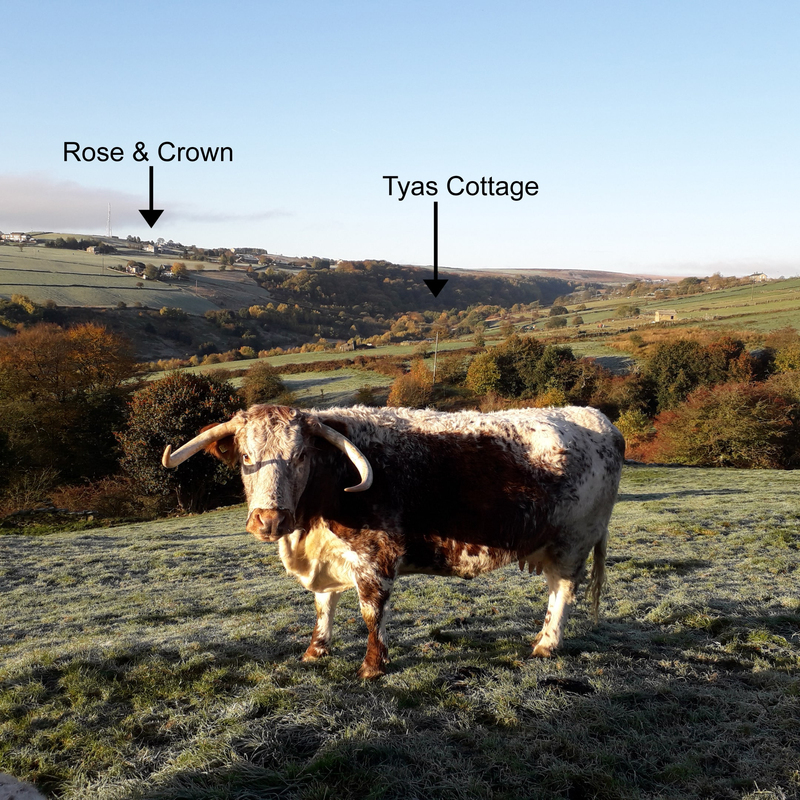 The Longhorn cattle that supply "Rumpus" usually graze on the slopes of Merrydale. Slaithwaite railway station is on the Newcastle to Liverpool route and the M62 is also within 5 minutes journey time. Slaithwaite itself is a charming village and worth getting to know, perhaps as the focus of the Merrydale walk. 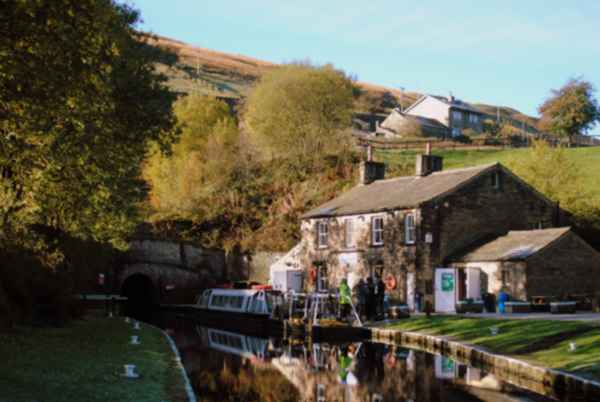 The nearby canal has been recently restored, and it is within walking distance of the Pennine Way. Tennis can be played on courts with spectacular views (near Marsden) and there are 11 golf courses within 5 miles. Titanic Spa, a mere two and a half miles away offers superb facilities. 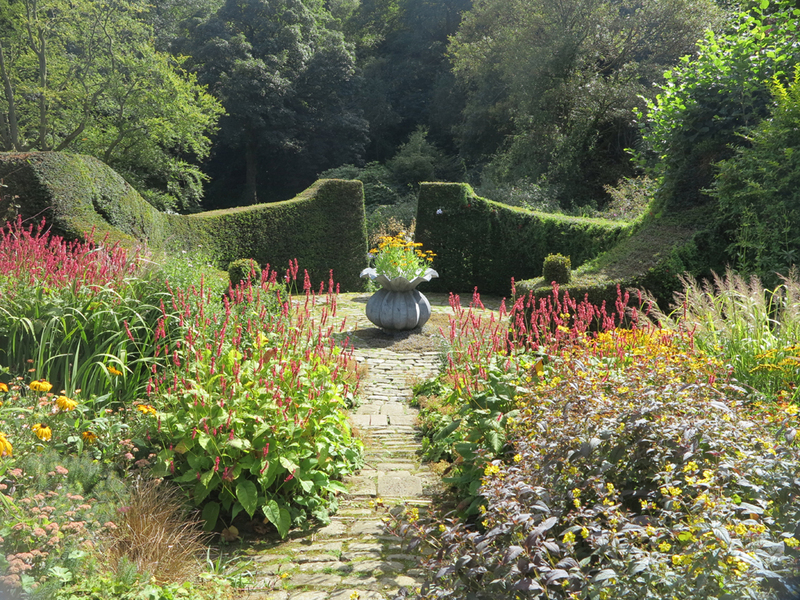 You may well be interested in gardens, as our own gardens elicit many compliments and have won awards. Less than 12 miles away is the amazing, Dove Cottage Nursery. This has been an inspiration to me (and many others). It is NOT a garden centre, but grows its own material and its owners, Kim and Stephen Rogers, are extremely knowledgeable and generous with their advice. 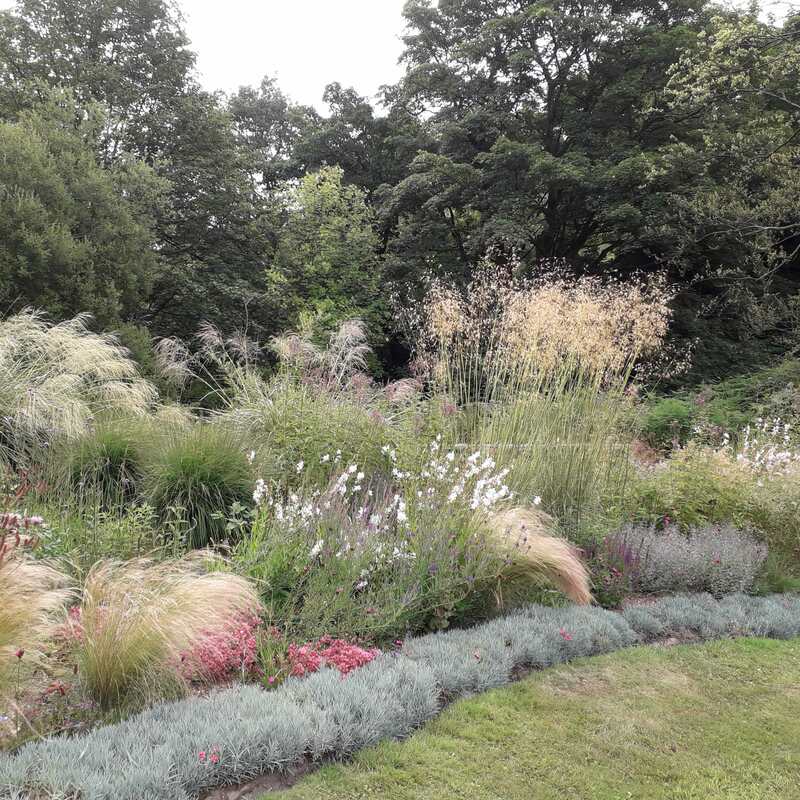 On a high altitude, north facing slope their demonstration garden is enormously instructive in showing just what can be achieved in our relatively harsh climate. 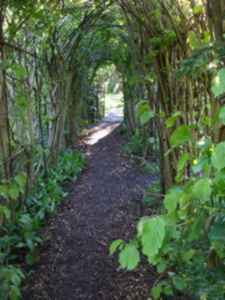 There are useful links to other gardens on the Dove Cottage website. Slaithwaite's Moonraking Festival now takes place during every second February half term (next one in 2017). Our new Green Valley Grocer Cooperative has shot to fame recently for their delicious artisan bread and local produce. I recently attended one of their bread making courses and can't recommend them too highly. I now understand why slow fermented artisan bread making is a skill that is best taught by example. I would be happy to give interested guests some of my sourdough culture (dating from 1970). You can read about their bread making courses on this link. 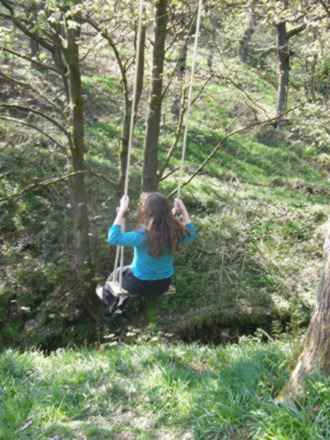 Also running courses nearby (including permaculture, scything, fruit tree grafting) is a new venture, www.edibles.org.uk. Emmerdale Village, beyond Leeds, can be visited and on the 3rd Sunday every month there is the farmers' market in Holmfirth as well as numerous other attractions there that can be found on this link. 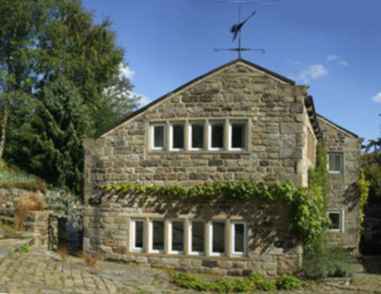 Guests stayed here in early June to attend the Oldham and Saddleworth Whit Friday Brass Band contests that are held in villages around Saddleworth, such as Delph, Denshaw, Dobcross etc. Huddersfield, home of the famed Choral Society and internationally renowned Contemporary Music Festival, is a fine town and has some lovely buildings. The Lawrence Batley theatre is in the very elegant Georgian former Methodist Mission and John Betjeman considered the station to be the finest in the land. Halifax, too, has some wonderful buildings. Urban attractions include the Colne Valley Museum (in Golcar about 4 miles away, but only open at weekends and bank holidays). Halifax not only has Eureka Childrens' Museum but also the fascinating Bankfield House costume collection with its contemporary crafts exhibitions. The National Coal Mining Museum is much praised by our guests (and free). 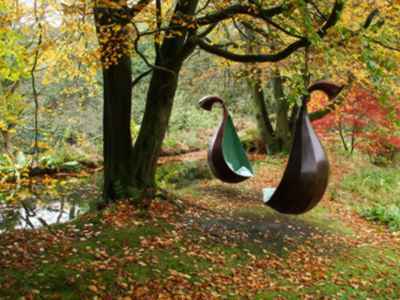 The Yorkshire Sculture Park is a must for anyone interested in fine art. 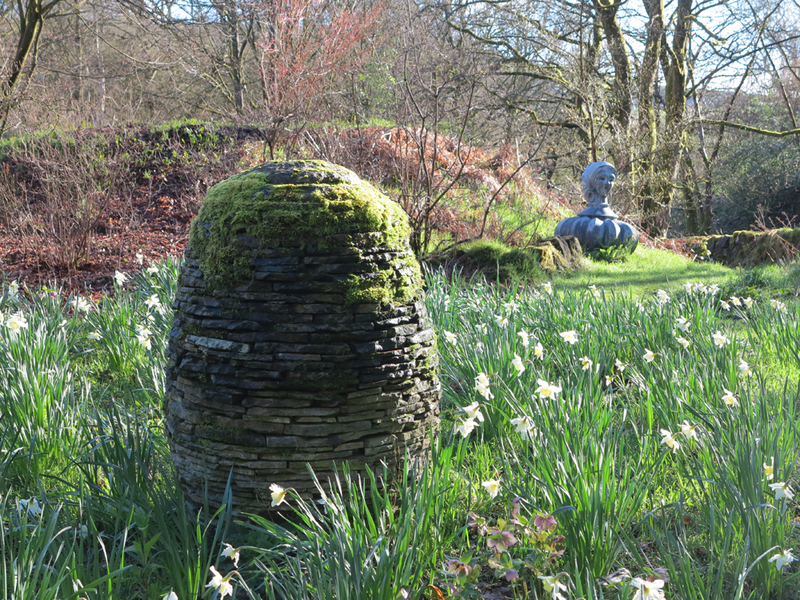 In addition to world class exhibitions, you can discover more than 60 sculptures in the open air by renowned artists, including Henry Moore, James Turrell and Andy Goldsworthy. A little further away there is also the recently built Hepworth Gallery (winner of the British Design Awards, 2011). It is about 43 minutes journey time from Tyas Cottage. You can see Hepworth's work on this link. 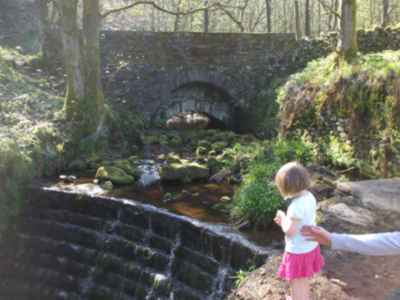 The bridge and waterfall that adjoin the shared garden. In the shared garden, twice daily mother duck leads her eight ducklings from the millpond and across the lawn. In the background it is just one enormous rose (Rosa "Belvedere") that grows over 3 shrubs and extends almost to the top of the oak tree. The blot on the lawn is a duck with her brood of ducklings. Our guests are often keen to find out more about the planting in the shared garden. "When we were about to get lost on the country road, the landlord made a phone call and drove in time to pick up. She followed her car through a narrow and deep path. The mossy stone walls on both sides were full of ancient times. I thought it was time. Entering the world of Middle-earth...and this "Medium World" that is in front of our eyes is a real paradise! Thanks to the landlord Vicky for providing such an old and comfortable big house and a beautiful and charming garden, so that we can experience the cultural heritage of the original British people and their deep heritage!" 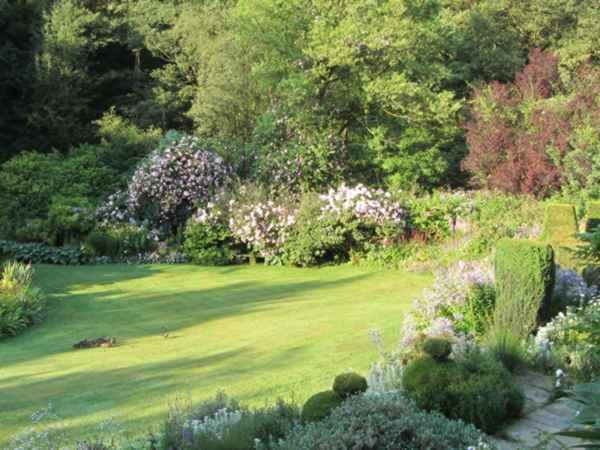 "Absolutely superb - an enchanting house and garden, comfortable, relaxing and very pleasant. Hope to be back next year. " "Cottage lovely in beautiful surroundings. Had everything here we could possibly want." "What a lovely place! The garden is absolutely beautiful! The pods are so comfy for reading! It is like I have travelled back in time and free'd myself from all of life's stresses. I am even getting used to the narrow road! The pub uphill has generous food and owner....I could not have asked for a better place to bring my dad and his grandsons. Thank you so much for the beauty of it all." "We've thoroughly enjoyed our stay in your "wow factor" cottage............It's been wonderful to return here after the Pennine Way." 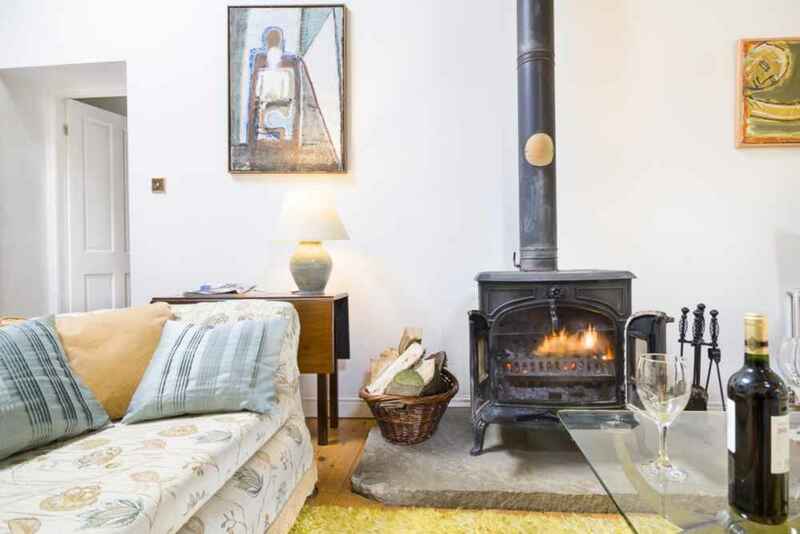 "Superb cottage, comfortable and really well equipped. 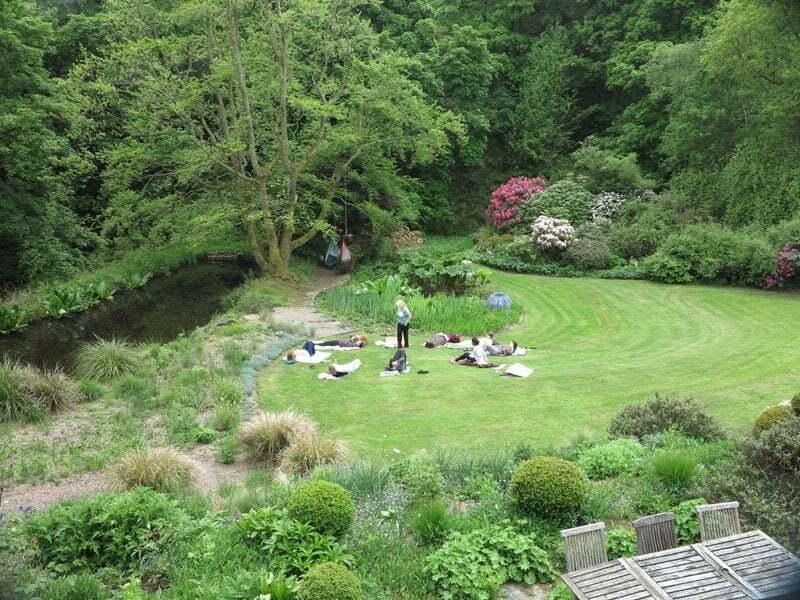 Incredible setting and a memorable garden." "A beautiful pace to stay - a special place to leave from with our daughter on her wedding day." "A magical fairyland. 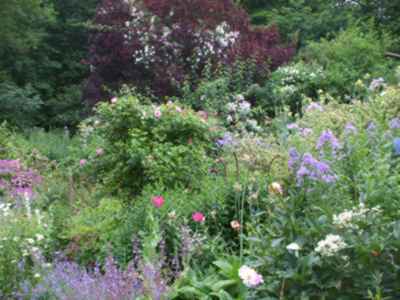 We've enjoyed staying in your lovely cottage and being in your beautiful garden very much. Thankyou." "Congratulations on the outstanding quality of your renovation and the choice of setting! Well done also on trusting your guests with such lovely old furniture! 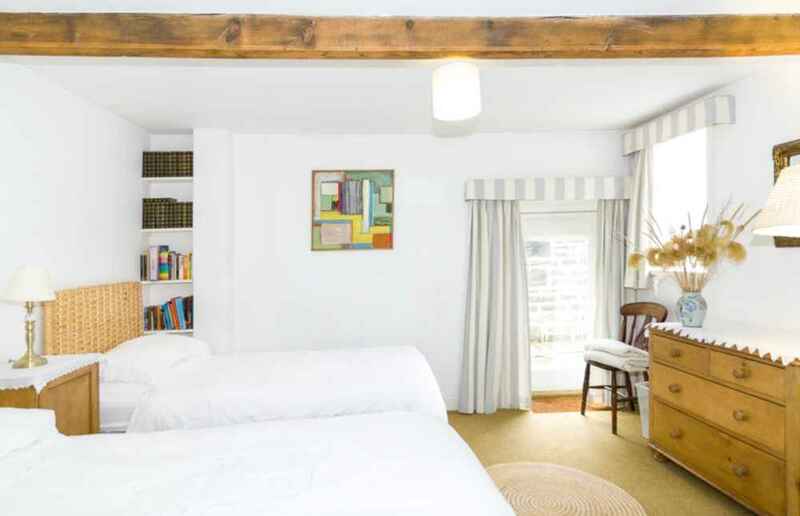 We thoroughly enjoyed our stay and were only sorry it was so short." 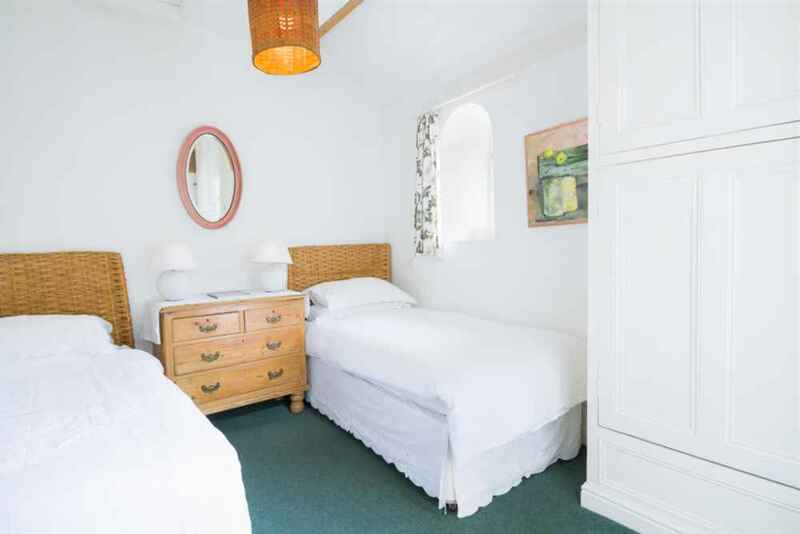 "An outstanding cottage in a really beautiful setting which together can only result in a fantastic, relaxing holiday. Hope to come again. " 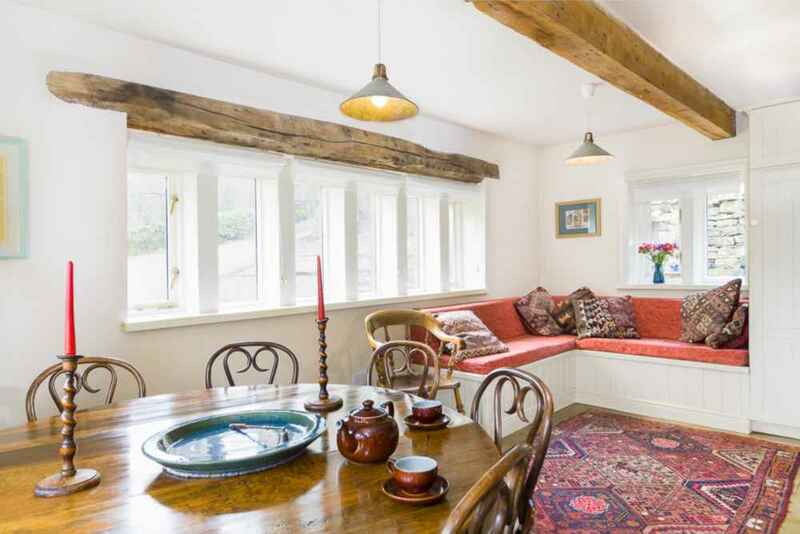 "A lovely warm, relaxing cottage! Great surroundings.' 'You live in a wonderful place - thankyou for sharing it with us. We loved the stream + bridge + especially the duck." You can book online or contact Tyas Cottage by phone or by email. Email: vicky.berryman(at)gmail.com but substitute (at) with @. e-Self-catering Directory The E Self Catering Directory offers information and contact details for Self-catering accommodation throughout the UK and around the world. Apartment rentals in Prague city centre, in the Old Town and the Wenceslas Square. A selection of 158 apartments for rent in Prague historical centre, all furnished and serviced 24/7. 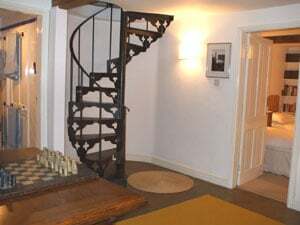 Aberfeldy Cottages in the Scottish Highlands for self catering country cottage holidays in Perthshire, Scotland, UK. Luxury vacation accommodations around Aberfeldy, Perthshire, Scotland, UK. Vail Ski Lodging - Get discounts on ski lodging in Vail. Dubai Tour Company - Corporate travel agent, Dubai Tour Company can arrange Dubai city tours, Dubai Tours and safari tours in Dubai for International and Emirati visitors. Make your bookings with our dhow tour company in Dubai. Holiday Accommodation Directories. Hotels, Cottages, Caravan & Camping Sites and more! England | Scotland | Wales | N. Ireland | Rep. Ireland | British Isles Charter bus travel - Get charter bus rental transportation quotes by visiting our website and our 60-second transportation quote form. Nationwide service for charter bus travel. Samoa Accommodation: Samoa Hacienda(Samoa Holiday Home), A Samoa accommodation for nature lovers with huge garden filled with tropical plants and flowers. Cheap Hotels near Westend Theatre - Comfort Inn London Edgware Road is one of the ultimate hotel offering accommodation near West End Theatre. 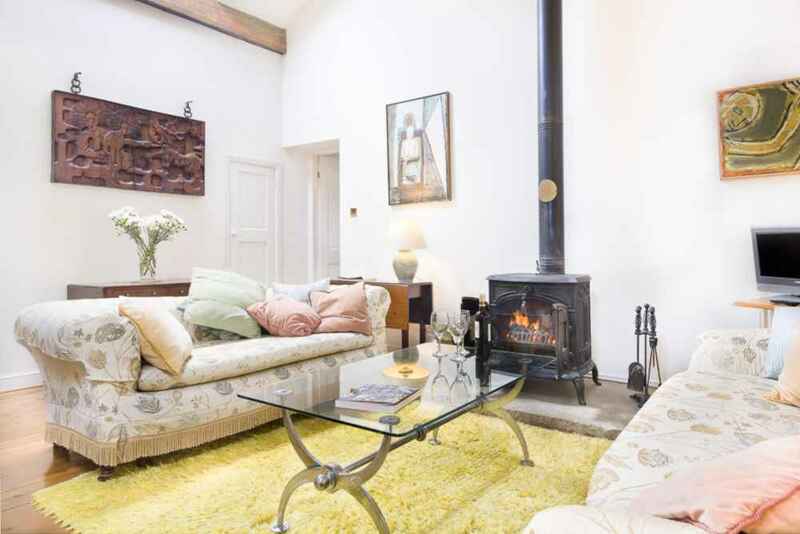 Tidal Homes Northumberland Find luxury holiday cottages in Northumberland at Tidal Homes! 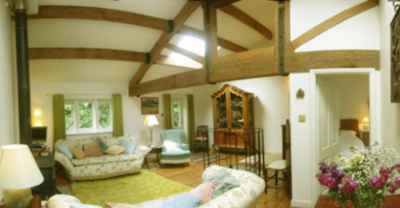 They provide exquisite self catering cottages in picturesque coastal regions of Northumberland. Holiday Homes - Choose from a large selection of holiday homes to rent direct from their owners. Car Hire UK - Car Hire UK provides comfortable,luxurious,cheapest cars that makes your journey pleasurable and enjoyable. Rent a Car at Cape Town International Airport - Rent a Car at Cape Town International Airport is one of the best car rental companies with large number of flexible car rental options. Car Rental Liege Liege Car Rental for your comfortable and pleasurable journey. We provides luxurious, cheapest and excellent cars. Find out more about us - cheap car rentals across Estonia. Shanedietresorts weight loss vacation -Weight Loss Vacation Shane Diet Resorts offers healthy weight loss programs by combining diet nutrition fitness and fun for 18 and 25 year olds. 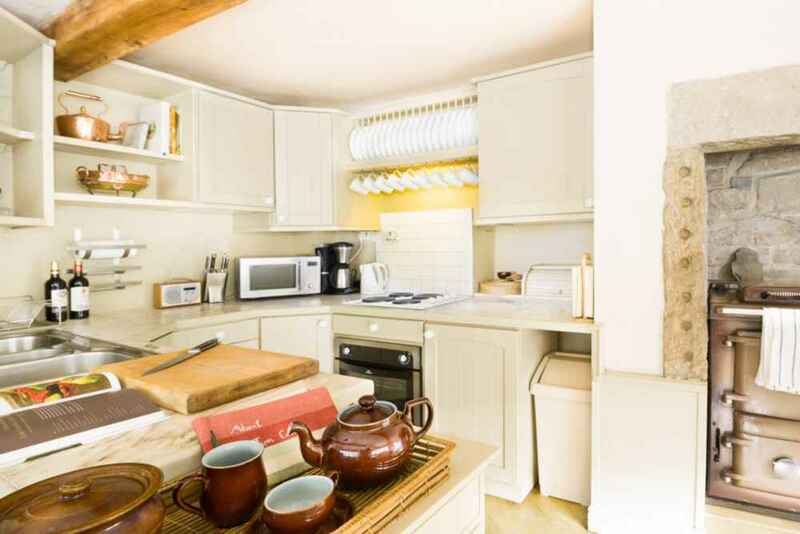 e Self Catering Directory The e Self Catering Directory offers information and contact details for hundreds of self catering properties across the UK and further afield. Royal Rajasthan on Wheels Get online booking and detailed information on Royal Rajasthan on Wheels. Enjoy once in a life time experience on the Princely Royal Rajasthan on Wheels. Spiral Staircase - No 7. We have gates and a corset like attachment to make it child-safe.